The Gigabyte Aorus X9 is about as far from portable as you can get while still retaining the name ‘gaming laptop’. It’s too big for a laptop sleeve, too heavy for a backpack, and all around totally impractical on the go. But, its durable metal frame, as heavy and ginormous as it is, also encases some of the best components money can buy. It just can’t be beat in benchmarks. The Aorus X9 has certainly got performance on its side. Its desktop-grade Nvidia GTX 1080 is more than capable of dealing with absolutely any game running at ultra, so long as the laptop’s cooling solution is up to spec. Luckily, the dual fans and six heatpipes of the Aorus X9 are more than capable of keeping the GPU relatively cool – if not a little loud in the process. At least under moderate load it’s quieter than its little sibling: the Aorus X5. That same cooling system is also responsible for keeping the CPU, Intel’s six-core, 12-thread i9 8950HK, cool under pressure. This unlocked CPU clocks all the way from 2.9GHz up to 4.8GHz, and, either through Gigabyte’s Aorus Command & Control software or directly through the BIOS, can be overclocked further if you really want a processing powerhouse akin to a fully-fledged desktop model. And that goes hand-in-hand with what the Aorus X9 actually is: a desktop replacement. The Aorus X9 holds nothing back for performance, and while it’s hard to argue with pure speed no matter what you throw at it, gaming or rendering, when it comes at the expense of even moving your laptop more than a few metres around your home due to its considerable weight and size, it is no longer justifiable. Aside from the top-notch silicon from Intel and Nvidia, the Aorus comes with a cacophony of other features stuffed into its aluminium chassis. One of the most notable of which has to be the fully-mechanical RGB keyboard, albeit sans caps lock and num lock indicators. Yep, despite the RGB plastered across the Aorus X9’s bulky frame and keyboard, not one of them indicates whether the caps lock is activated or not. Caps lock debacle aside, the X9’s mechanical keyboard is actually one of the most enjoyable to type on. The recessed board and low-profile tactile (brown-like) switches from manufacturer TTC actually make for a keyboard I’m happy enough typing away on for the better part of a day. The screen is a rather conservative 1080p panel. I mean it’s still a 144Hz G-Sync IPS with solid contrast, blacks levels, and saturation, but for an otherwise ludicrous gaming laptop, it’s rather restrained. I have to commend the decision, too. For a laptop with a price tag upwards of $4,000 (£3,799), it would’ve been all too tempting to throw on a 4K panel. That would be a screen the GTX 1080 would’ve never use to its full potential without thermal-throttling or taking off into the stratosphere, and could also push the price even higher. 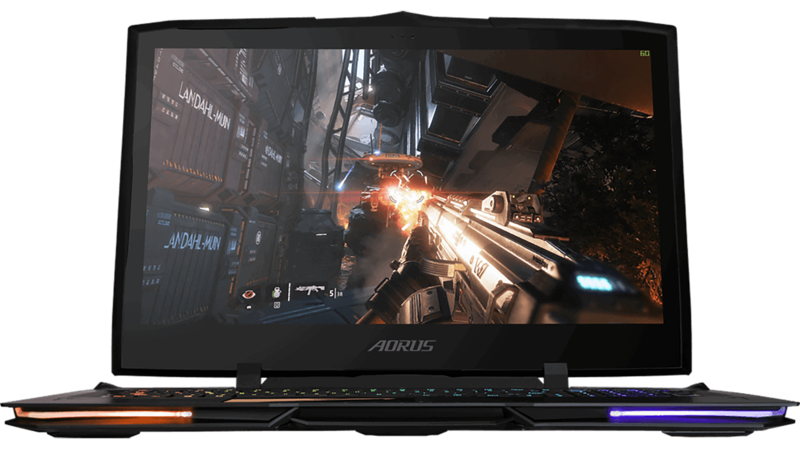 The Aorus X9 easily banishes every other gaming laptop we’ve had in to test when it comes to pure performance. But that’s a bit like comparing apples and oranges. While it easily tops the Cinebench R15 charts, only losing out to the desktop-grade Ryzen 7 1700 equipped Asus GL702ZC, and easily obliterates every other laptop in the GPU-intensive Heaven benchmark, beating the Asus Zephyrus’s score by over 20%, at least those laptops have some semblance of portability. 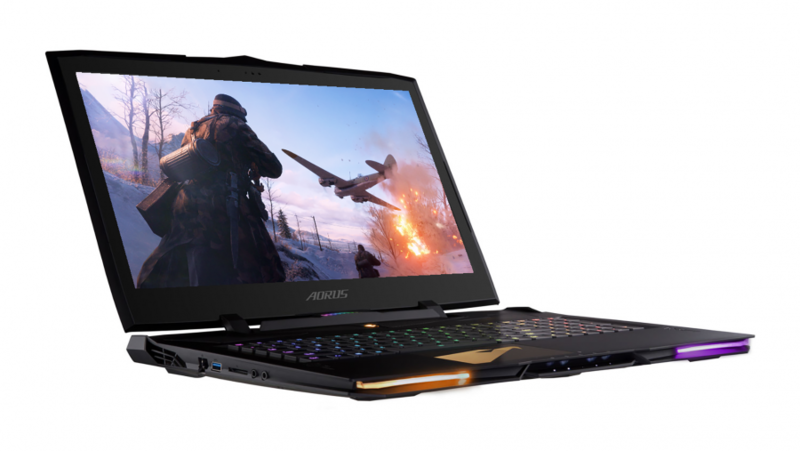 The Aorus X9 represents the extremes of gaming laptop potential right now. For those fringe gamers out there looking for a little less than a desktop, but a lot more than a laptop, it is one of the more slender overkill gaming laptop designs out there and incredibly well-built to match. But, for the rest of us, it just doesn’t quite strike the right balance between power and compactness for daily use. While it outperforms its peers in our benchmarking gauntlet, the Aorus X9’s gigantic shell won’t find much use as a laptop. Instead, its considerable bulk relegates it to the life of a desktop replacement - and an expensive one at that.